Another comic book event that happened in 2015 was DC Comics’ Convergence. Convergence spins out of the final issues of the weekly series, Earth 2: World’s End and The New 52: Futures End. The story involves Brainiac collecting cities and inhabitants from various timelines that have ended, trapping them in domes on a planet outside of time and space and opening them up to see what happens. The comics ran for 8 weeks and we got them all. We had to create a good reading order so that we can follow the story along beyond the main event. Some websites provide reading order, with lot of details about plotlines, ratings and how well does it fit in the timeline. I just want a list. So I decided to create one myself. I spent many hours making this list, and decided this may be useful for others who are in the same boat as us. 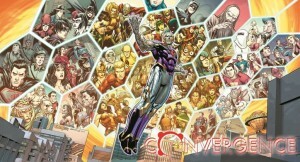 – On going comic book series along with the number (for example, Green Arrow # 002). Click here to get a printable check list and reading order.